Is your process for delivering new software applications detailed and compliant? If your organization is struggling with concerns around continuous delivery, integration, and validation, DevOps can help. DevOps is a software engineering practice that aims at unifying software development (Dev) and software operation (Ops). DevOps principles call for monitoring all steps of software creation, beginning with integration, testing, and release, and then moving on to deployment and infrastructure management. This approach leads to a more effective and efficient process, leading to shorter development cycles. Tier 0: Traditional Waterfall – Traditional waterfall is the most basic form of software development. It is a step-by-step, serial process where each phase is completed before moving on to the next. Completing each step before moving on creates easy-to-maintain recordkeeping as the organization moves toward compliance. However, this approach is often more costly and less efficient than more agile approaches, since issues are typically discovered very late in the process. 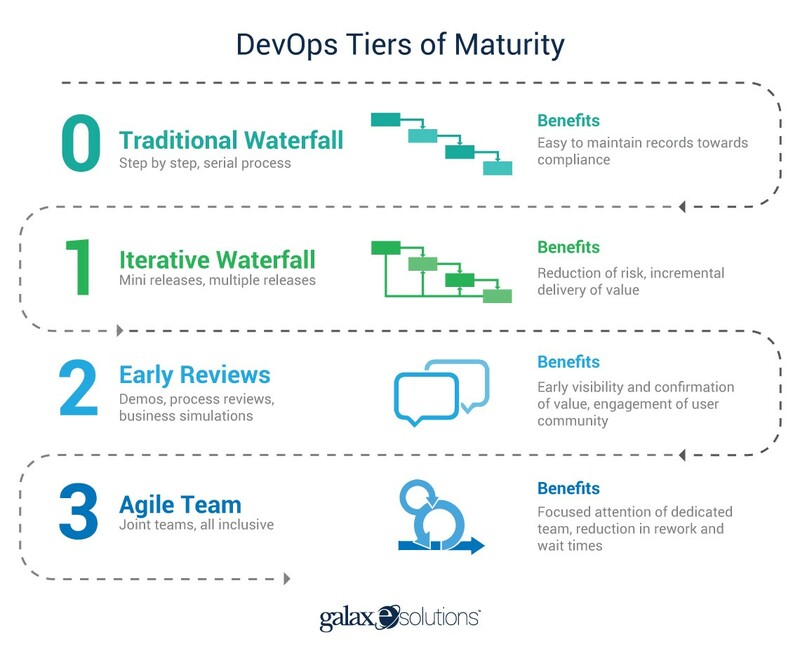 Tier 1: Iterative Waterfall – Rather than creating one big software release at the end of the development process, an iterative waterfall creates multiple “mini-releases”. There are still distinct phases, but they are intertwined and overlap with one another. Process decomposition and process isolation are used to protect each part of the process. As each phase is completed, it is released to ensure it is working properly. This helps reduce risk and provides incremental delivery of value. Tier 2: Early Reviews – Demos, visualization, process reviews, and business simulations are used to gather valuable feedback early in the development process. These early reviews give visibility to the project, provide confirmation of value, and help engage the user community. Early reviews allow the software project team to focus on the right items and take preventative steps to improve the probability of success. Tier 3: Agile Team – In this approach, separate agile teams are designated for each step of full integration of new software. The teams work together to ensure agility and continuity. As each dedicated team focuses on addressing issues in its part of the process, its members gain valuable expertise, reducing wait times and the need for rework. After climbing these tiers, an organization will move through Tiers 4-6: Transition to Agile, Agile Practices, and CI/CV/CD (Continuous Integration/Continuous Validation/Continuous Development), before reaching the highest level, Tier 7: DevOps. DevOps uses integrated delivery of development, support, and operations, along with automation and monitoring at all steps of software construction. This allows for more frequent releases in order to “fail faster,” resulting in more dependable software.